Delhi Chief Minister and AAP chief Arvind Kejriwal hit back at Congress president Rahul Gandhi for saying he has made a U-turn on the AAP-Congress alliance. Reacting to Rahul Gandhi’s tweet, Kejriwal accused the Congress of helping Prime Minister Narendra Modi by diving the anti-BJP votes. He said Gandhi's tweet shows that he is not interested in an alliance and it is all rhetoric. "What U-turn? The talks were still going on. Your tweet shows that alliance is not your intention but only a show. It makes me sad that you are only making big statements. Today, saving the nation from the Modi-Shah threat is the most important mission. It is unfortunate that you are splitting the anti-Modi votes in UP and all other states," tweeted Kejriwal. 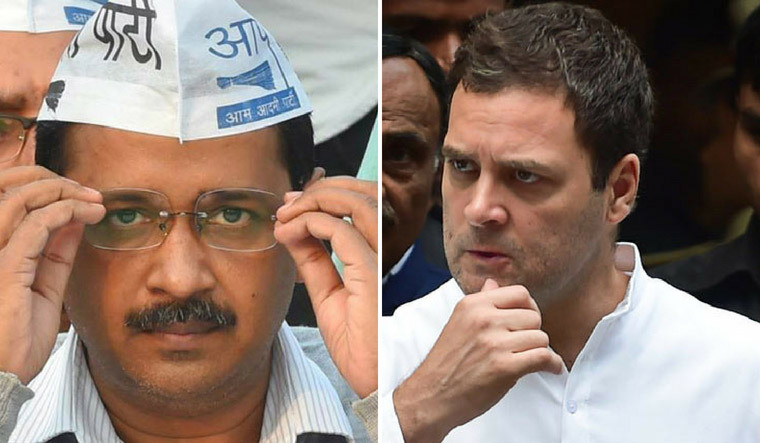 Earlier, the talks between Congress and AAP hit a roadblock when the latter demanded that if there is an alliance they will contest 33 Lok Sabha seats in Delhi, Haryana, Punjab and Goa, which did not go down well with the Congress. Congress chief on Monday said while the Congress was ready to give up to four seats to the Aam Aadmi Party (AAP) in Delhi, it was the stance taken by AAP leader and Delhi Chief Minister Arvind Kejriwal that was playing spoilsport for any possible alliance with the party in the state. "An alliance between the Congress & AAP in Delhi would mean the rout of the BJP. The Congress is willing to give up 4 Delhi seats to the AAP to ensure this. But, Mr Kejriwal has done yet another U turn! Our doors are still open, but the clock is running out," tweeted Rahul Gandhi. AAP has already announced candidates for all 7 Lok Sabha seats in Delhi while the Congress is yet to announce any name. Earlier in April, Kejriwal had blamed Rahul for refusing to join hands with the AAP. However, after repeated failure of talks, both the parties have now eased their demands in order to forge an alliance in Delhi.